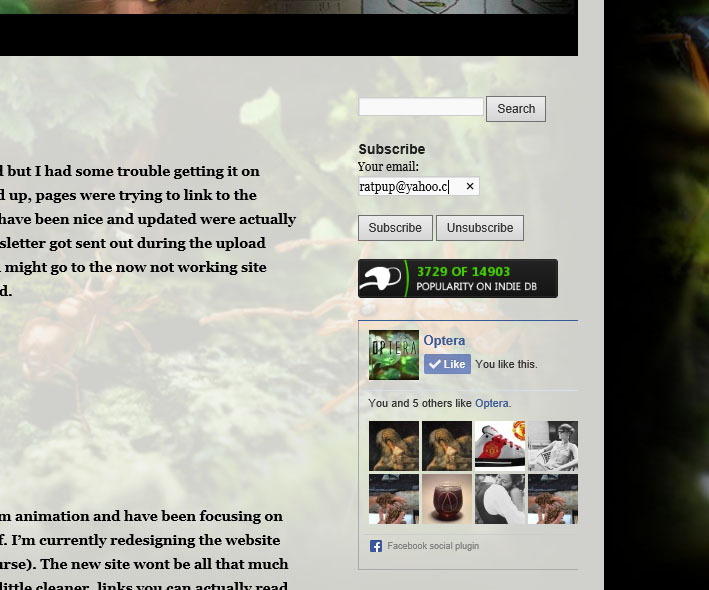 So the site looks a bit different these days. Its pretty self explanatory but I figured I would throw a brief description of the different features up here so people quickly know what’s what. 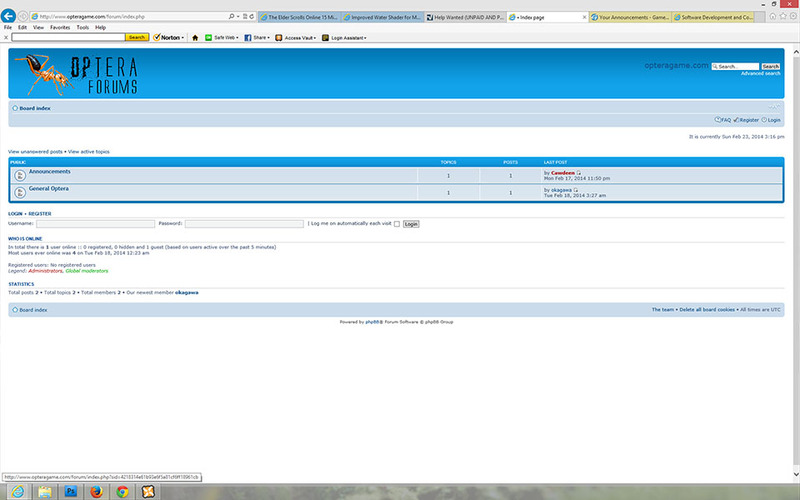 Aside from just looking different the first change was with the header and menu. The main page is now the “news” page which basically just shows all the most recent posts. I have now created an “about” page which answers a few very basic questions about the game and its current state in development. If you haven’t seen that yet then take a look. It is short and sweet I promise. Media page blah blah it’s the same pretty much. The “community” menu item is new. Aside from clicking on community and being brought to the community page, you can also just hover and see a few links to some social media type stuff. Its all connected now. 5 Facebook likes is pretty embarrassing (one of which is me) so if you have a few split seconds to spare, help me out and click that button. You’ll be helping this project move one step closer to completion believe it or not. That means you can play sooner! On to the forums! The forums are super simple. So simple in fact that there is no one on there! There isn’t much to talk about I guess. Still, register and say what’s up. It makes me work harder. Seriously. 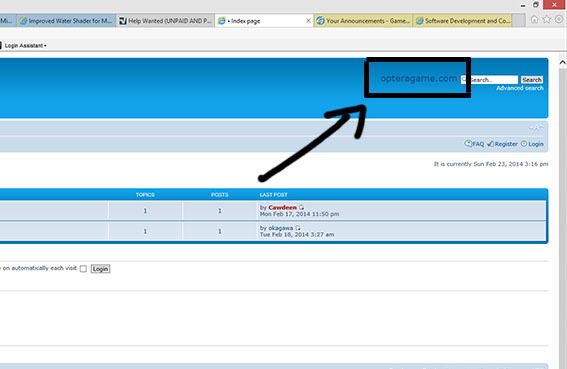 See that “opteragame.com” thing at the top of the forums to the right? Yup, it brings you back to the main website. You’d be surprised how many forums don’t have that. I made sure to figure that one out. Just for you guys. Back to opteragame.com! Sorry I had a lot coffee this morning and I’m all pumped up. Check out the right column. Search box! simple. Search for aphids. You’ll find nothing probably. Subscription box! Simple. Sign up I tell you! I send out like one newsletter a month or even every couple months. Very not annoying, unlike the 5 emails a day I get from Men’s Warehouse. If you don’t sign up you’ll forget about Optera by it’s first release and miss out on the super exciting first generations of barely evolved species. Don’t you want to see how the biodiversity of Optera got its first humble beginnings? Of course you do. Subscribe. Ok on to the next sidebar thingy. Indie DB. I don’t have a ton of stuff on there yet, but at least Optera has a couple of nice comments. People are awesome. Nice comments are my fuel for hard work. That and Facebook likes, which conveniently enough is just under the Indie DB thing hint, hint. 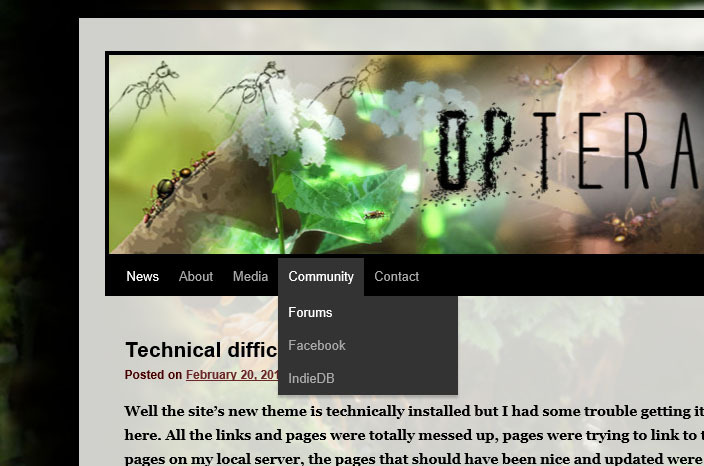 Like Optera on Facebook, subscribe to the newsletter, create a new topic on the forums, AND leave a comment on Indie DB or even better yet put something on Reddit? Ill do backflips and draw ants for like 48 hours straight.